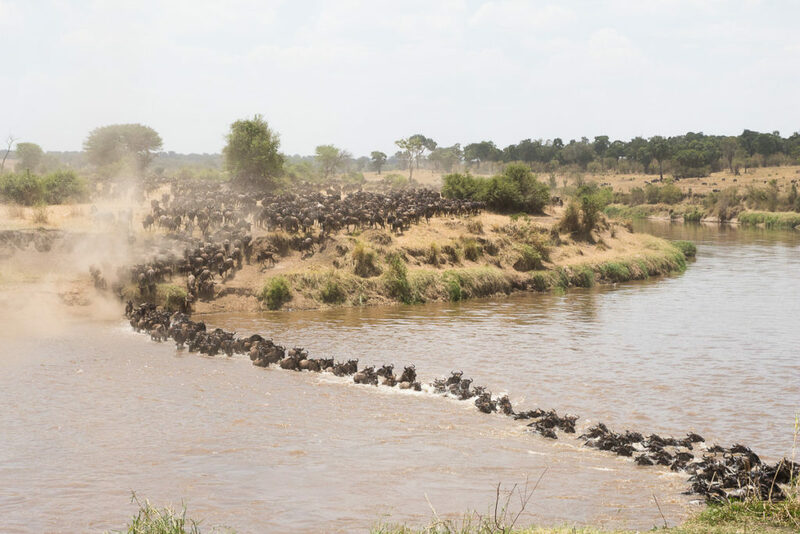 So you’ve decided to visit the Serengeti and want to catch a glimpse of the world famous Wildebeest River Crossings as seen on National Geographic, but now the million dollar question: When is the best time to visit? I completely understand the dilemma, believe me, this was one of the biggest questions I had while planning our Africa trip and probably the biggest stressor as well. You’re going to run into conflicting answers on websites and even more vague answers from tour operators. I even reached out to the TripAdvisor forum angels for their advice, bless their souls. First, I can’t promise you’ll walk away with a specific answer since there are many factors (mainly Mother Nature), but I can share with you the information I gathered while researching the question myself and my experience of witnessing six (yes, six!) river crossings. So let’s clarify a few things. 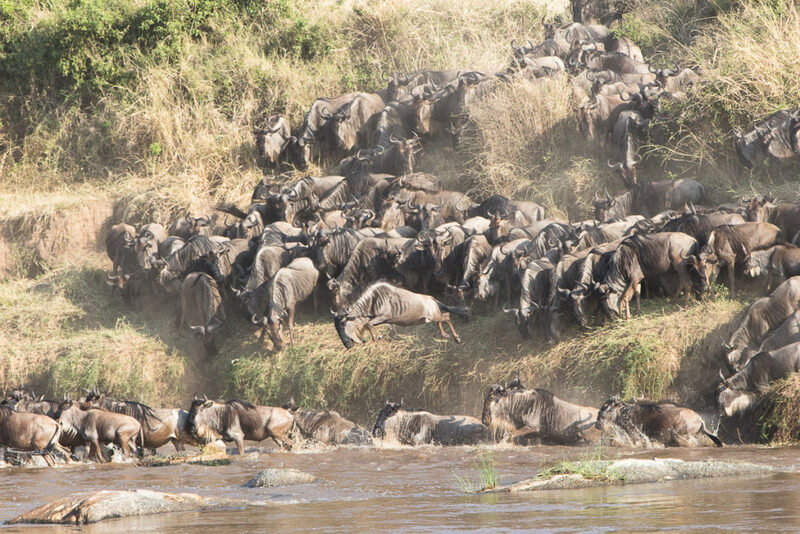 The Wildebeest Migration takes place year-round in the Serengeti National Park and refers to the hundreds of thousands of wildebeest that migrate around the Serengeti in search of grass to eat. What does that look like? Hundreds of thousands of large mammals are spread across the plains of the Serengeti as far as the eye can see. Due to the changing seasons and rain patterns of the Serengeti, wildebeest (& zebras) need to move to follow the rains for fresh grass since they will eventually deplete an area. They literally move in a huge clock-wise circle in the Serengeti that covers thousands of miles each year. The famous River Crossings televised on National Geographic and YouTube refer to when wildebeest cross the Mara River to go in and out of Kenya in search of green grass. This only happens in the Northern Serengeti (area known as Kogatende),i.e. when herds move there. 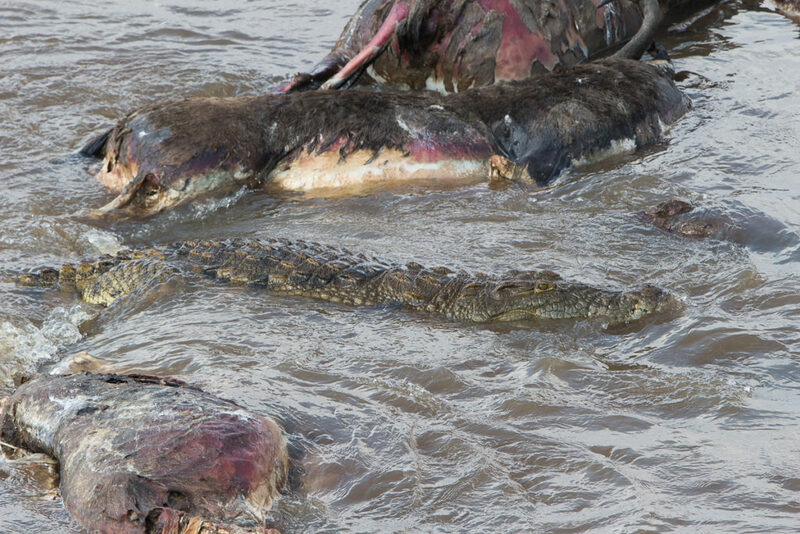 While watching thousands of animals cross a river is a spectacle within itself, a number of other exciting things can occur such as the hungry Nile crocodiles eating a wildebeest, some drown, some get lost, others break a leg, will the baby make it?!? And if this doesn’t sound interesting, watch a few of these videos to wet your appetite (pun intended). Jump in the water is great! January-March: Wildebeest can be found in the southern Serengeti. Also known as Calving season, because wildebeest give birth to their young at this time of year. Quite an experience watching an animal give birth (we witnessed a giraffe with an unsuccessful birth). But what makes this worth seeing is wildebeest babies are known to be able to stand within 15 min of birth and can run in about 1 hr. They need this to be able to keep up with the migration and run away from predators. As you can guess, where there are young’ins, there are predators so lions are known to follow the migration and aim for the babies. We’d like to go back one day to witness this part of the cycle. 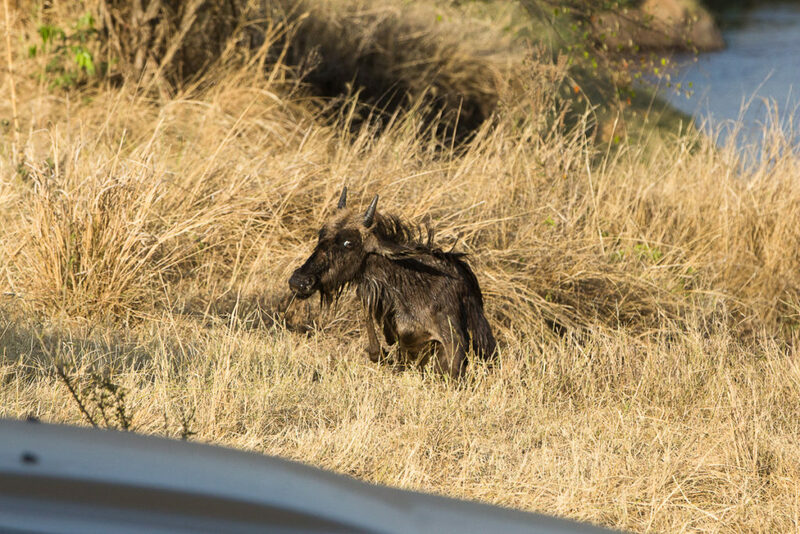 April-June: Wildebeest pick up and move north towards the Western corridor. Note, the Grumeti River is here and there are river crossings that some go across. They say it’s not as spectacular as the Mara River (Grumeti is not as wide, deep, or big supposedly), but just know you may get your river crossing here. July-September): Headed North, this is probably the window with the highest likelihood to witness a Mara River crossing! Probably half of the herd will continue on to Kenya and the rest will stay in the North (Tanzania side). It’s probably best to aim for Tanzania if you’re in the beginning of this time frame and Kenya in the latter part, but it’s hard to predict when exactly. Keep in mind this is considered peak season and rates will reflect accordingly. Fall (Oct-Dec): Rains cause the animals to pack up and high-tail out of Kenya back to Tanzania to the East Serengeti and eventually the South, where the whole cycle repeats again. If it’s a dry year, herds could be reaching the North & Kenya earlier (as in our case, when the Migration finished the Kenya portion and started coming back to Tanzania in late Aug when we were there). If it’s a wet year, the herds could be delayed in reaching Kenya. Also, if you experience rains on a day, the animals may not even bother to move that day. Keep in mind, you may be at the right place but the wrong time. Herds don’t necessarily cross every day. The best advice I can impart is the more days you spend in the North, the higher your chances are. We spent 3 days and 1 morning before our flight, and felt that was more than adequate. Do I visit Kenya and/or Tanzania for a River Crossing? 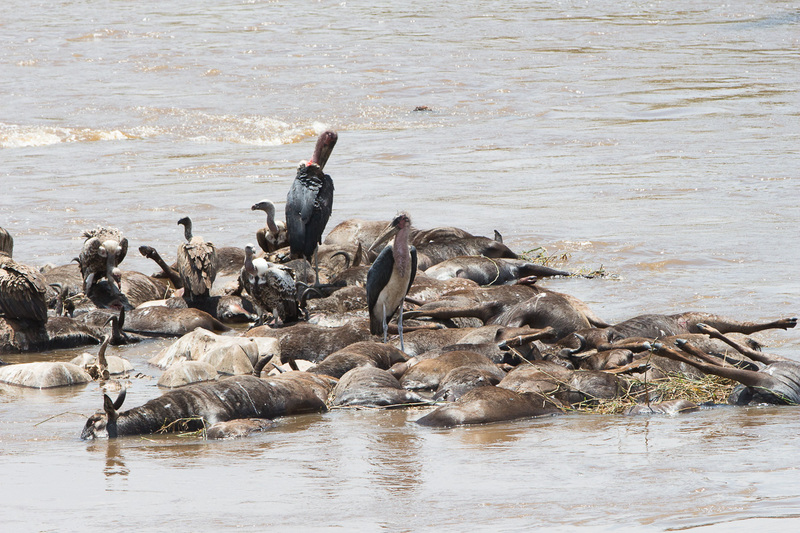 Here’s the answer: There are river crossings in BOTH Kenya and Tanzania! Now, there are a total of ~13 river crossing points. Supposedly, the animals only cross at certain points based on the topography and ease. The majority of these points are on the Kenya side (I think) and why most people rave about Kenya is because supposedly the more dramatic river crossing points are in Kenya. And believe me, there are different levels of river crossings to be had, oddly enough. We witnessed 6 crossings in 4 different points and they were all different. And yes, some are more dramatic than others. Check out our trip report (Day 9-12) for our breakdown of the different crossings we witnessed. While animals move about KY and TZ as they please, we are subject to border control. Unfortunately, border crossing points are outside the Serengeti National Park and take over a day to drive out of the proper Park exit, stay overnight at the nearest town, cross the possibly hectic border customs, then drive to enter the proper Park gates on the other side. All of these points are several hrs away from each other and add in traffic, poor roads, and driving in a safari vehicle. Alternately, if you fly, you need to backtrack into a major international terminal first (ie NBO Nairobi or JRO Kilaminjaro) first to get your visa and customs, then you can fly into a small safari airport. Either way, it’s a pain, expensive, and time-consuming. In the end, we chose to skip the extra $100 Kenya visa and take our chances with the Tanzania side. While we missed the main herds because our season was especially dry, we still saw 6 crossings and felt it was more than good enough. …Waiting all morning for a crossing, then decide to just head back to camp to eat lunch only to find out a crossing happened 5 min later when other guests come back…it happens! We really hope you witness a crossing, but keep in mind that your entire safari isn’t just about a crossing. There are so many other exciting things you will get to see. It’s a short affair, but well worth it and does stand out as a highlight of the trip. Determine if you want to take the risk of trying to catch a River Crossing. Will you be okay if you don’t see it? Are you able to travel during the proper months? Keep in mind herds may be early or late each year. 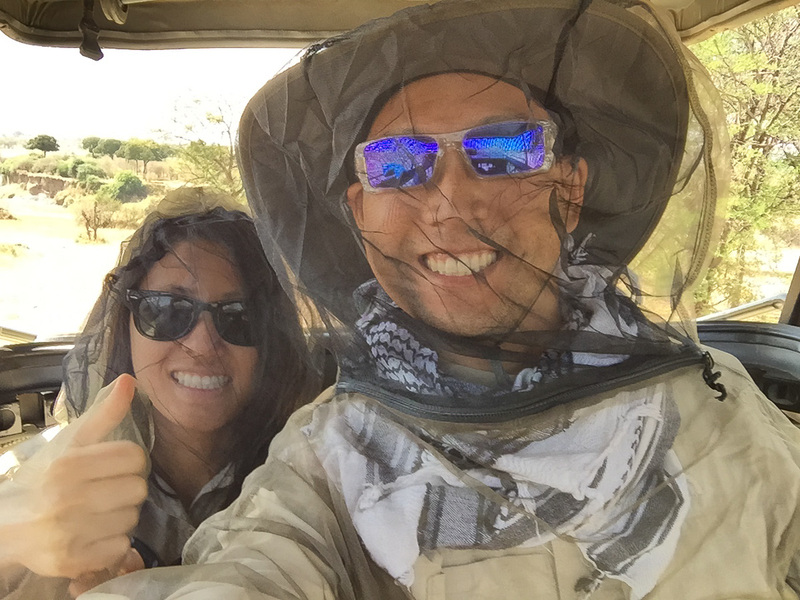 Determine if you want to go to Kenya and/or Tanzania. We recommend sticking to just one. Consider if you have the time and money. 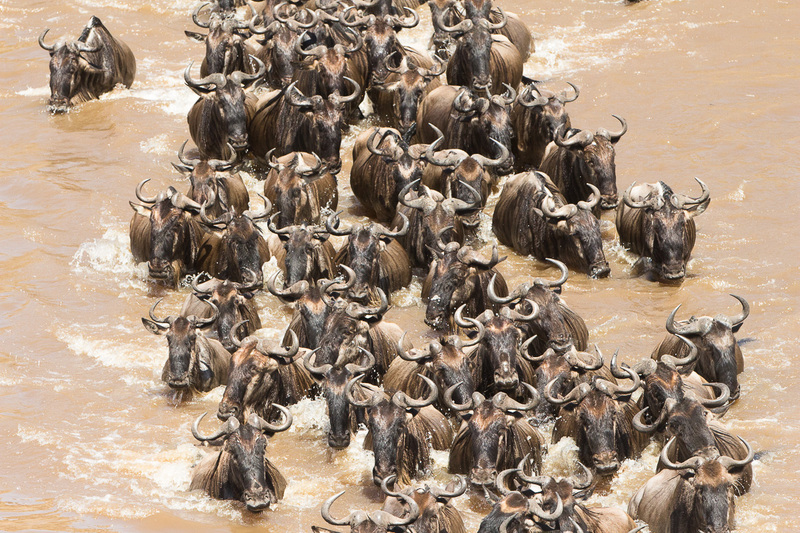 The more days you spend in the North Serengeti (ie Kogatende region), the higher your chances of catching a crossing. Keep in mind it takes one whole day to drive from Central to North Serengeti and vice-versa. A plane ride would be much faster but costs more. Camps in the North also cost more during peak season. The tourism industry is set up to essentially cater to you, so they have mobile camps set up wherever the migration is located (the general vicinity). 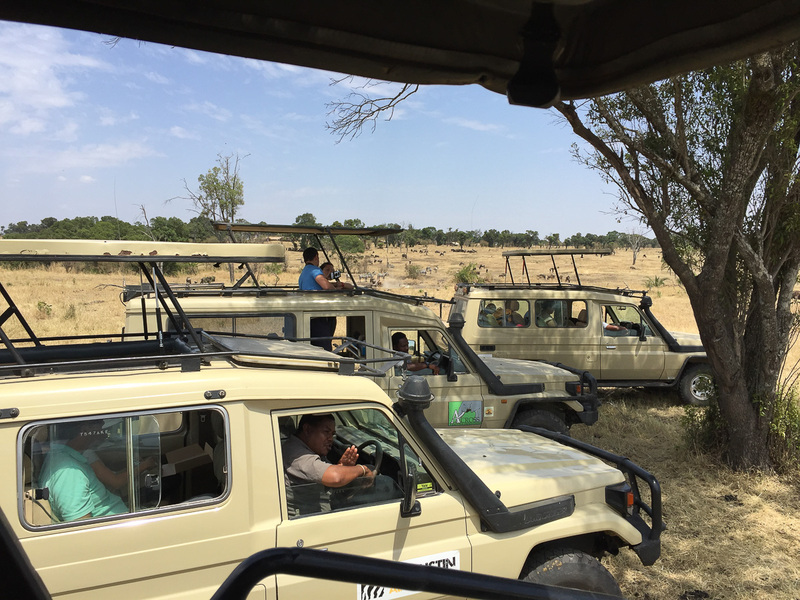 The actual site may change from year to year, but generally speaking there are certain areas that a company/owner can set up camp at in each section of the Serengeti. And by mobile, I don’t mean that these camps move each day following a herd. They will move for months at a time based on the time of year. These camps tend to be more basic. There are some permanent hotels/camps in each area. The only exception is the Central Serengeti area, home of the large cats and animal action year-round, so you will see posh permanent camps set up in permanent spots there.